Lee & Low Books, 9781620141625, 56pp. In many places around the globe, the new year starts on January 1. But not everywhere Chinese New Year is celebrated in January or February. Iranians observe Nowruz in March. For Thai people, Songkran occurs in April. Ethiopians greet the new year at Enkutatash in September. All these diverse cultural, regional, and religious observances, and many others, have deep-rooted traditions and treasured customs. Acclaimed poet Marilyn Singer has created a lively poetry collection that highlights sixteen of these fascinating festivities, some well-known and some less familiar. 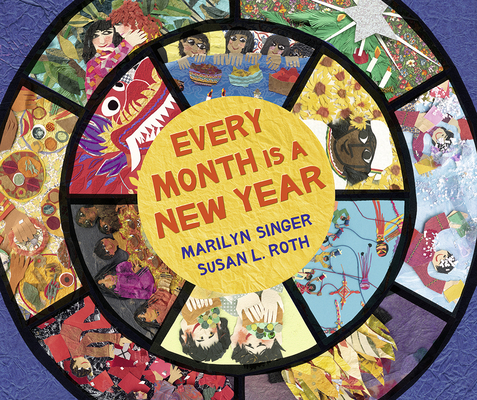 Together with Susan L. Roth's captivating collage illustrations, the poems take readers to the heart of these beloved holidays. Every month of the year, somewhere in the world people celebrate with joy and good wishes for a happy new year.